Proof why you should regularly get your hot water system serviced. The importance of a regular hot water system service. Can you guess what the “sand-like” substance is? The “sand” was actually a mix of an active ant nest, their refuse and the foam insulation from inside the tank. 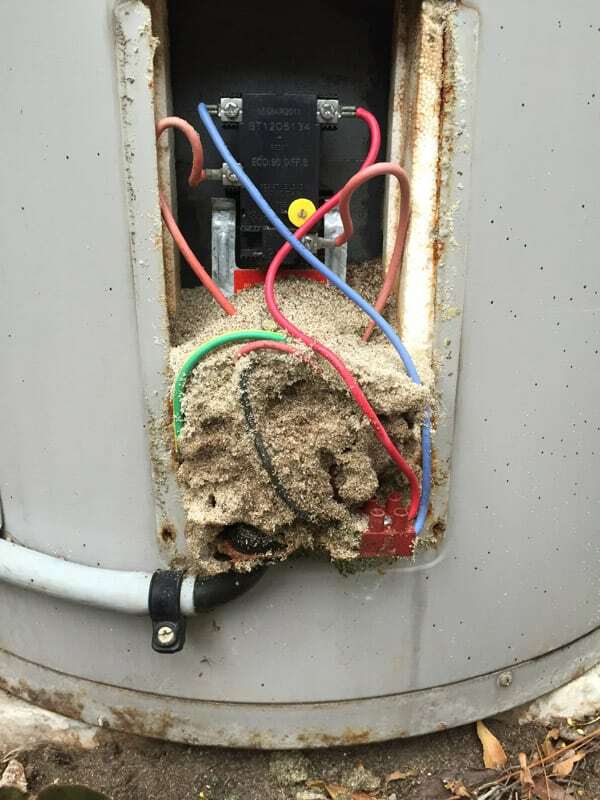 Customers are always surprised when confronted with an ant plague in their hot water system however it does provide a warm, dry home for ants and other pests. Like cockroaches are drawn to the warmth of dishwashers and fridges, ants are often drawn to hot water heaters. Once onsite we cleaned out the bottom of the hot water heater, removing the ant nest and refuse. Unfortunately the ants had chewed through the electrical components, which we were able to replace on the spot. Within a few hours of calling us, the customer’s hot water heater was running again – ant free. A regular service by one of our authorised hot water repair technicians will ensure you enjoy trouble-free hot water for many years to come. A regular hot water service ensures your system continues working safely whilst increasing the cylinders longevity, therefore saving you both money and inconvenience of future breakdown. Your hot water service should be undertaken by a licensed hot water plumber no longer than every five years. If this time period lapses it may result in the manufactures warranty becoming void. It doesn’t take long for a technician to service a system – usually between 30 to 45 minutes. It’s a small price to pay for peace of mind and trouble free hot water usage. To book a hot water system service call 1800 266 999 or complete our online enquiry form. A service typically only takes 30-45 minutes. Anodes are steel core rods installed at the top of the hot water tanks during production to prevent rust and corrosion. The rods are surrounded by either magnesium, aluminium or zinc. They have been a staple of hot water heaters for decades and are very useful in preventing water tank damage and regular and expensive replacement costs. 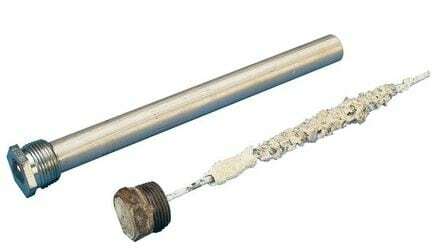 Also known as ‘sacrificial anodes’, through electrolysis, the rod will spent instead of the water heater’s exposed steel through a process called electrolysis. It protects the metal from rusting. Electrolysis occurs when the two pieces of submerged metal rod react to a voltage. Anodes typically last between 3.5 – 5 years. Once the anode has fully corroded it fails to protect the tank which will start to deteriorate. In time, a rusting water heater will cause problems which are typically more expensive to repair than simply replacing the anode. Regular anode replacement ensures your water heater continues to operate as intended and lasts longer therefore saving you money in the long term. Hot water is our business! We are your local hot water service specialists covering all Sydney suburbs and the Central Coast. Our trucks are on the road right now, filled with thousands of spare parts and replacement gas, electric and solar systems to ensure you’re back enjoying hot water today.